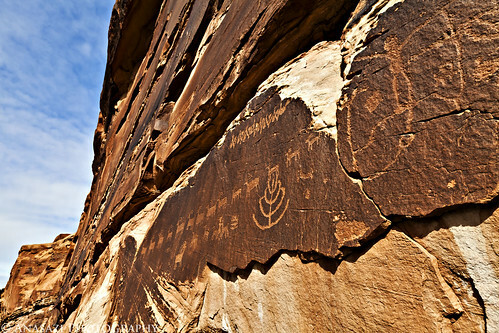 One of the many petroglyph panels found along the Hidden Valley Trail near Moab. Not only are there many amazing petroglyphs found in this area, there also appears to be many long lines of bighorn sheep in the area. This is one of the longer lines I have come across. The day I hiked this trail the weather forecast was calling for a 60% chance of snow. I decided to head to Moab anyways and hike the trail. Lucky for me the weather turned out to be perfect…it was a great day for hiking…I’m glad I didn’t stay home!